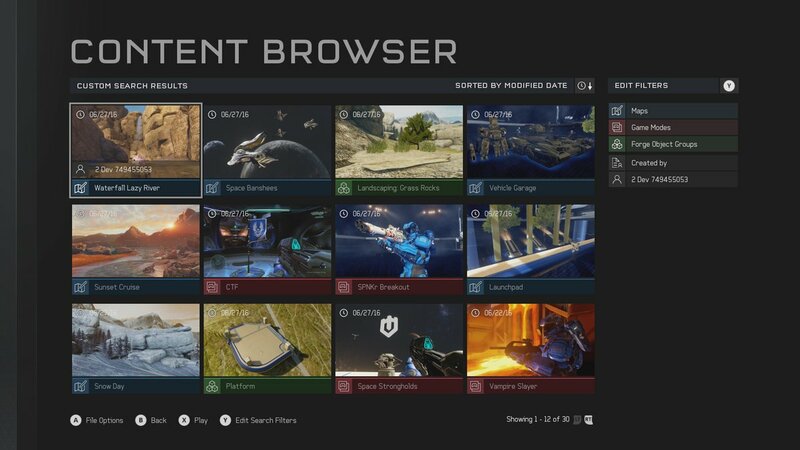 Halo 5 Forge receiving revamped content browser. The Creative Assembly’s Halo Wars 2 received a new cinematic trailer at RTX 2016. No, there isn’t any gameplay in it but there are some pretty impressive visuals and fight sequences to be had along with teases at the story. Take your jollies where you can get them we suppose because Halo Wars 2 is still a ways off from release (February 21st 2017). In other news, Halo 5‘s Forge browser on Windows 10 is receiving an overhaul. The official Halo Twitter revealed an image for the revamped content browser and how it will make finding Forge creations that much easier, which you can check out above. And though it’s currently bound for Windows 10, expect to see it on Xbox One soon as well. Halo 5: Guardians was also recently expanded with Warzone Firefight, a throwback to the old Firefight mode from Halo 3: ODST but this time with REQs, bosses and time-based rounds. Halo 5 is also free to play for Xbox Live Gold till July 5th so try it out now if you’re so inclined.